This is possibly my favorite costume I made this year – maybe my favorite costume I have made for myself ever. The color is a burgundy-red, with holographic foil finish. This fabric always runs the risk of looking cheap or tacky, but I think I managed to make it look shiny, pretty, and expensive. The overall look is exactly what I wanted, and I couldn’t be more pleased with the finished dress. I used a lace overlay on the mystique foil fabric. I also really like the back and the flowy arm piece. This dress took a long time to sew. I used a non-stretch lace over the stretch metallic fabric, so I had to piece it on sort of like a jigsaw puzzel to allow the under fabric to stretch when I put the dress on. It wasn’t complicated, but it did take a long time to sew on all of the lace pieces. 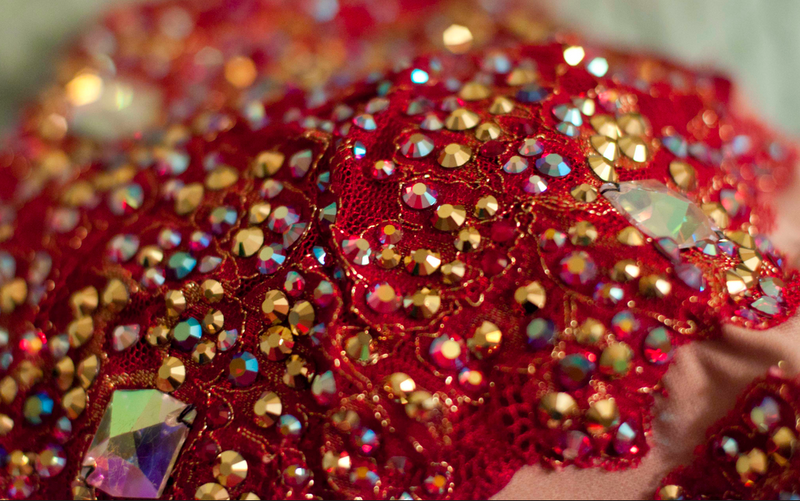 I used mystique spandex as the main fabric, with a tan stretch lining, red and gold metallic lace overlay, and illusion mesh for the arm piece. 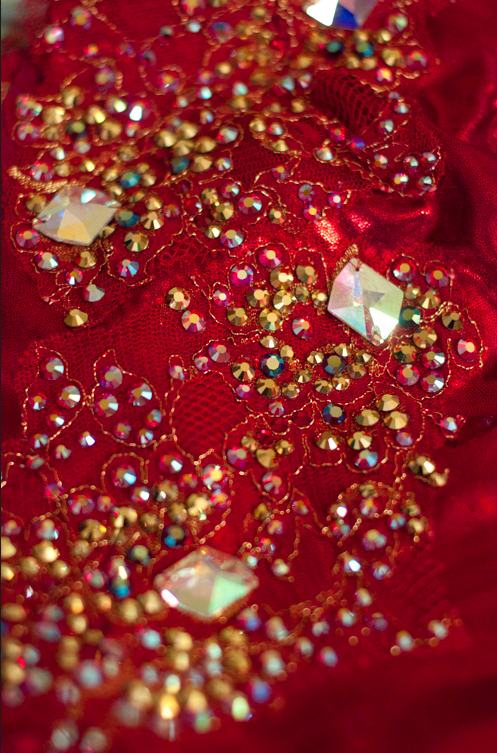 For the beading, I used aurum and siam AB Czech Preciosa glue-on rhinestones, with larger crystal AB sew-on stones (I used cheap Chinese and Korean knock-off stones because I was looking for quantity over quality here. Up close there is most definitely a difference in quality between these and the more expensive Swarovski stones, and the coating is not as robust on the cheap stones, but at 200 feet you really can’t tell the difference at all. For several hundred dollars in savings, I was willing to use the lesser quality stones). I am pleased with the fit, color, and design of the dress. I wanted something sparkly and showy, but still elegant and classy. I love the beading and overall look of this dress. 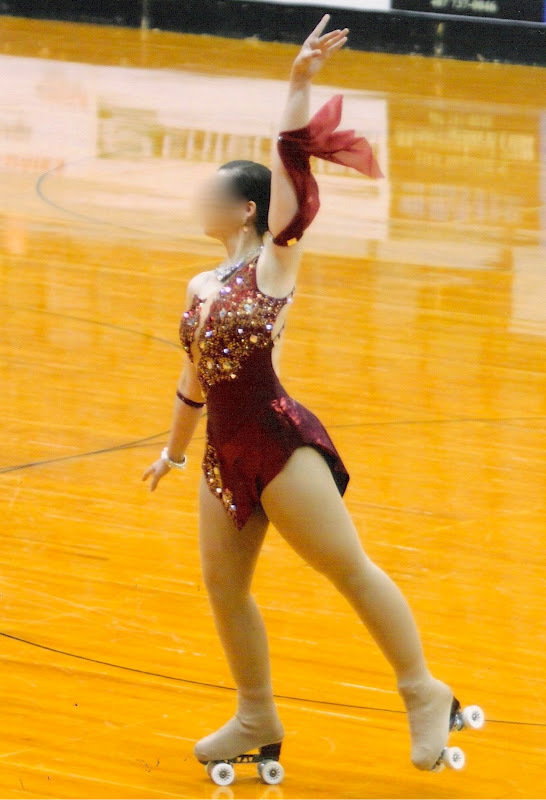 It is possibly my favorite dance dress ever, and I am planning to save it and use it at nationals again in the future. Wow! That looks fantastic! I'm not usually keen on foil effect fabrics but that really is beautiful and the stone work looks very striking. So elegant. I think many years from now this will have to be in a glass cabinet at the Roller Skating museum! Well, it's certainly not difficult to see why you,ve been getting commissions! What an absolutely gorgeous dress. Holy shmoley thats amazing! Do you think we could have more closeup pictures? That is one of the prettiest leotards i've ever seen 😀 All the american skating dresses look good, but this one… WOW! That beading is incredible! I'm not half surprised its your favourite. Do you get the chance to get multiple wears out of your skating outfits? Or are they like wedding dresses and only get a singular wear? 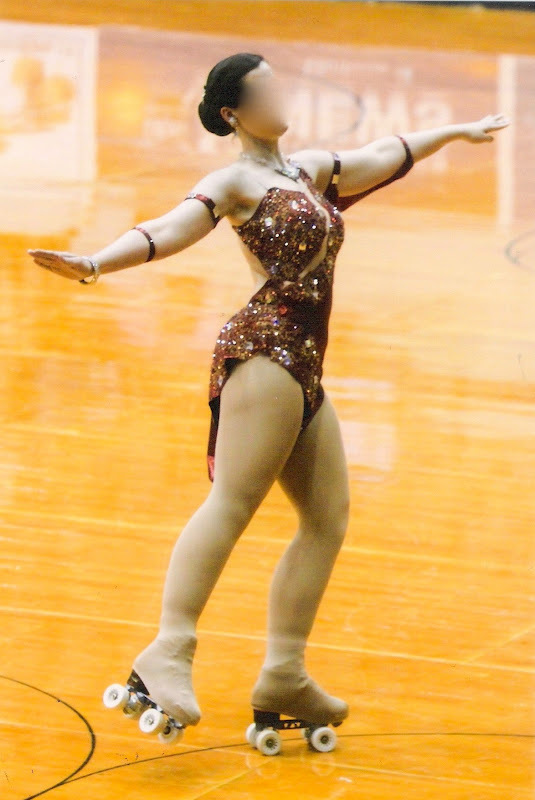 Usually I get at least one year's worth of use out of a dress – about 5-6 contests a year, usually skating 1-2 events at each contest with the same dress. Some costumes I use for multiple years, or put them away for a while, and then bring them back into service later. When I first started I needed new dresses every year because my size kept changing, but now I have a collection of the ones I have made, and they all mostly fit most of the time. My weight has fluctuated a bit, and that determines which costumes I wear some of the time, but in general my dresses have all been used multiple times, and still might be used again in the future. The beading makes them a lot more expensive than an average sewing project (at least for me), but they do get used often enough to where I think it is justifiable. These look very professional! Do other skaters inquire as to whether you will sew on commission? Yes, I actually had my first commissioned dress this year! I made one for competition for another skater, and then several practice outfits for a bunch of different skaters. I already have people asking for things for next year too! I don't really plan on sewing them up right away (right now is the down time before competitive seasons gets back in full swing), but I am sewing for others. I just am not posting them because they aren't my costumes. That is why the productivity seemed really low the past few months, even though I was sewing like a fiend. I am very impressed with your skating costumes. I have made my daughter 3 figure skating costumes but nothing quite like yours. I wish we had resources locally for nice stretch fabrics–I like to see before I buy. Your dresses are amazing! That is why I really like Spandex World (link on left sidebar) – they will send free fabric samples and the request form online is very easy to use. I always need to look at the stretch fabrics in person, but I have always been pleased with what I order from them because I can get a sample first.